The local currency Taka went down against the Euro and gained against the UK pound, and it remained unchanged against the Indian Rupee and the dollar in the inter-bank money market on Tuesday. The euro was traded between Tk 95.12 and Tk 97.09 on Tuesday against Tk 95.08 and Tk 97.02 on Monday. 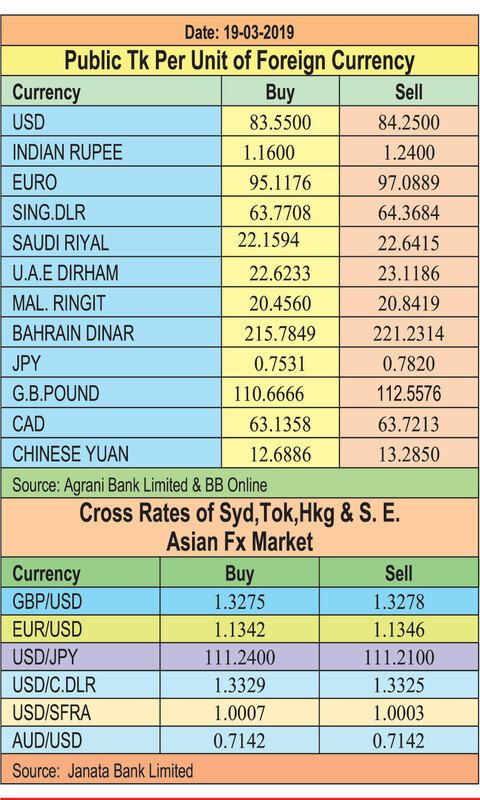 The UK pound was traded between Tk 110.67 and Tk 112.56 on Tuesday against Tk 110.82 and Tk 112.69 on Monday. The US dollar was traded between Tk 83.55 and Tk 84.25 on Tuesday and the Indian Rupee was traded between Tk 1.16 and Tk 1.24 on the day.